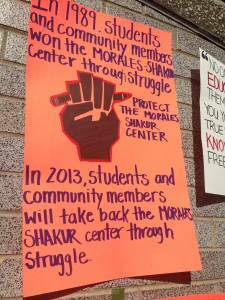 Fight to reclaim the Morales-Shakur Center at City College in NYC! On Oct. 21, hundreds of students and supporters marched in protest of the City College of New York administration's surprise attack on and shutdown of the Morales-Shakur Student Center. The action united many different groups, unaffiliated students and community members, who stood against a throng of police and campus security officers blocking the way to the stolen space. The police barricaded the doors when students tried to enter, which increased the anger among the students, who then went through a side door and through the library, chanting the whole time, before being stopped by another police line at the escalator up to the Center. A fire drill at one point pushed thousands of students, outside where they listened to student activists explain the illegal seizure of the Student Center and the necessity to struggle to reclaim it. In a sudden move on the night of Oct. 19, the administration closed the center, removed all the political posters adorning the space, painted over the emblematic fist on the door at the entrance and put up a new sign deeming the space a "Career Center." The administration then closed the entire main building for hours, including the library, to prevent the entrance of student activists. Occurring during midterm week, the library was supposed to be open 24 hours. The Center itself was won through student protest and struggle, when students occupied and protested in the thousands in 1989 against tuition increases. It is named after Puerto Rican revolutionary and independence fighter Guillermo Morales and Black liberation hero Assata Shakur, both of whom were CCNY students and now live in political exile in Cuba. The small room, which holds only 30 people, has nonetheless been a critical venue for student and community organizing over the last 24 years. For years, the Center has long supported student groups, including the Black Student Union and Students for Educational Rights. It has become an organizing hub for the recent protests against war criminal-professor David Petraeus, as well as anti-police terror workshops, community groups like the People's Survival Program, as well as initiatives to provide low-cost healthy food to the neighborhood and a space for discussions of gender and sexual violence. There is no doubt that the seizure of the center is a profoundly political act, an attack on radical student activism. It is not about the innocent expansion of a Career Center, as the CCNY administration claims. The early-morning timing of the raid and the way it was conducted, with lightning speed, behind the backs of those who operate out of the Center and the student government, are proof of this. The last major assault on the Morales-Shakur Center came in the form of a media campaign in December 2006. The New York Post and Daily News both ran editorials and front-page stories demanding the name of the center be changed, a call later echoed by CUNY Chancellor Matthew Goldstein. In that case, the seemingly out-of-nowhere attack on the Morales-Shakur Center opened up only days after New York City cops shot and killed 23-year-old Sean Bell in a hail of 50 bullets. It was a deliberate attempt to divert public attention from the cop murder by accusing CUNY students of supporting "terrorism" and a "cop killer." The Center hung tough despite this concerted campaign. Many student activists believe the CCNY administration is retaliating against the Campaign to End the Militarization of CUNY, launched this fall, which has directly confronted Petraeus for his crimes and embarrassed CUNY's ruling Board of Trustees. Much of this activism has been planned out of the Morales-Shakur Center. The Morales-Shakur Center, as a living legacy of popular student struggles in the past, stands in direct contrast to the image of CUNY that the administration and Board of Trustees would like to project. This unelected board, composed largely of right-wing functionaries, has been bit-by-bit eliminating the gains of the 1960s and 1970s, when student struggles converted CUNY into an open-admission institution. In the name of “high standards” and making CUNY "competitive" with private institutions, remedial classes were eliminated, tuition was increased and an increasingly exclusive upper tier of colleges developed within this supposedly "public" system. CUNY’s four-year colleges, such as City College, have seen Black and Latino student enrollment drop rapidly. Part of the drive to make CUNY "respectable" and "clean it up" from the ruling-class perspective is to promote high-ranking militarists like Colin Powell and David Petraeus. The flip side of this coin is to erase CUNY's legacy of student struggle, and demonize liberation fighters like Shakur and Morales. That the U.S. government has raised the bounty on the head of Assata Shakur, and falsely labeled her a "most wanted terrorist," undoubtedly gave fresh impetus to CUNY's rulers to plan the attack on the Center. Members of the ANSWER Coalition and the Party for Socialism and Liberation have participated in the effort to save the Morales-Shakur Center, and ANSWER has opened its office, a few blocks away in Harlem, for those activists displaced by the shutdown. It is clear that the CCNY administration is trying to use misinformation and police intimidation, including arrest and the open filming of protesters, to divide students and intimidate them. But with strong support from the community, on and off campus, as well as a determined struggle from the students themselves, the Morales-Shakur Center can be reclaimed. Fight to reclaim the Morales-Shakur Center! Hands off student protesters!